Our landlord had this flooring installed in our kitchen several months ago. There was one box of flooring leftover from the project, so I decided to put it in the pantry. 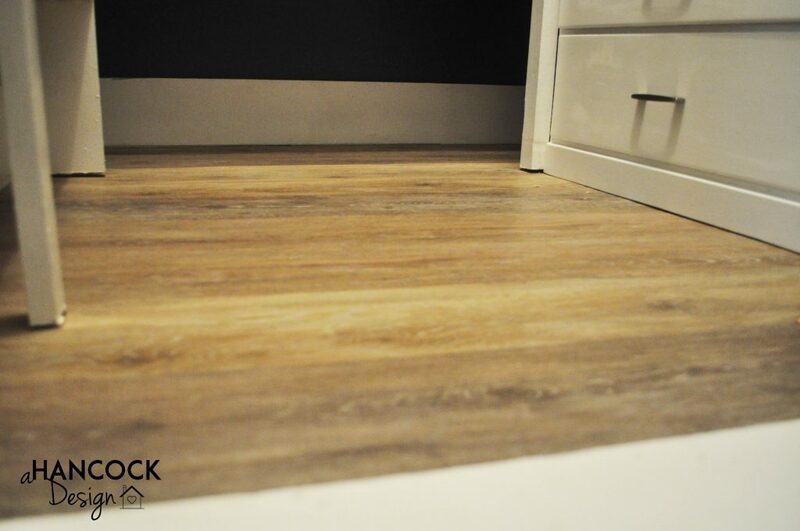 I had installed peel-and-stick vinyl flooring in a previous house, which was so very easy, and this vinyl plank turned out to be just as easy, if not a little easier. Before I could start installing, I had to rip up the old laminate floor. This started out easy and really quite fun, as I had spent the previous five years disliking that old peeling-up-in-the-corners fake wood linoleum floor. However, I was quickly presented with a problem. Layers of problems, actually. Beneath the fake wood linoleum was tiled linoleum. That had to come up, too. The tiled linoleum was a little more difficult because the tiles kept breaking off into little pieces. Underneath the linoleum tiles was a layer of plywood subfloor. Unfortunately, the plywood was so old that it splintered and some of it came up with the linoleum tiles. Uh-oh! Now my floor was uneven and rough and I knew there was no way I could install the new floor over splintered plywood. I didn’t know what was underneath the plywood. Was it another layer of flooring? Was it the deepest darkest depths of the crawl space under our house? After checking with the landlord and the carpenter who had replace the kitchen floor, I decided to assume there was something else under the plywood and go ahead and tear it up. Hooray! 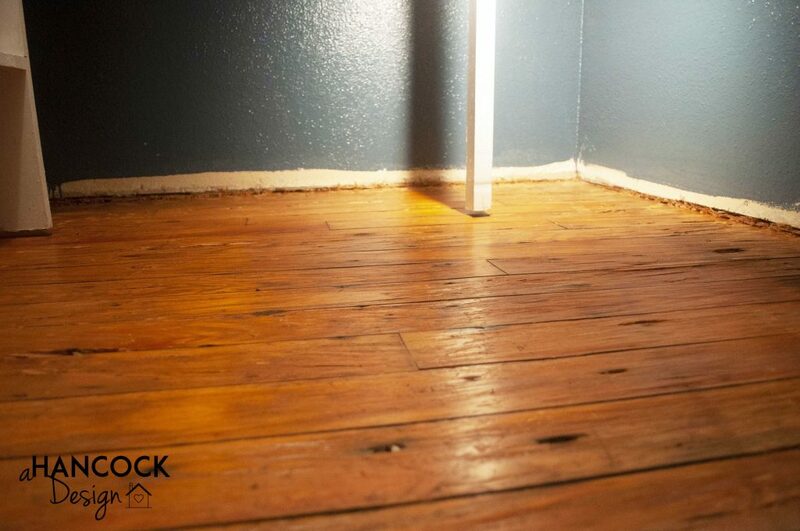 Underneath the splintered, oily, dirty plywood was the original pine flooring that is in other parts of our house. Most of the plywood came up pretty easily and I quickly got about 95% of the pantry floor down to the bare pine. And then I spent about four hours crouched under the bottom pantry shelf removing the other 5% of the plywood. 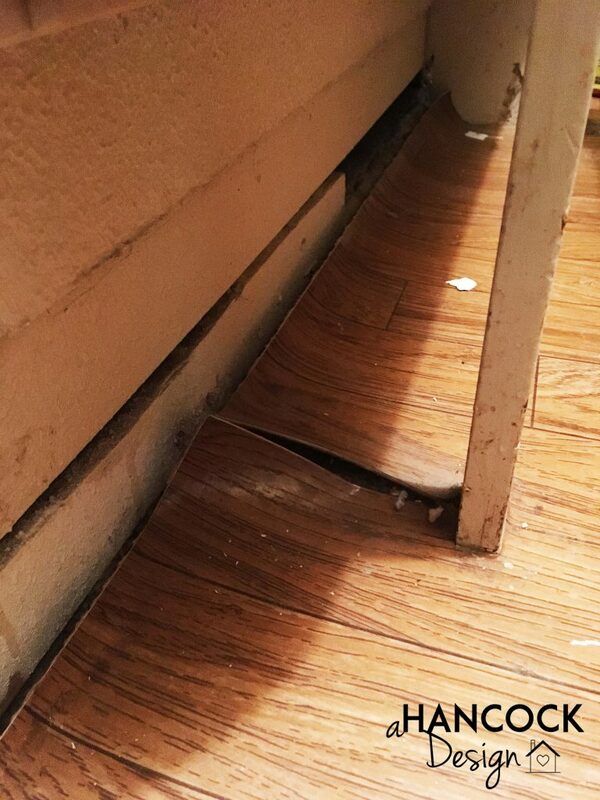 Apparently the plywood sub floor had been installed before the pantry walls were built, which meant that the sheet of plywood disappeared under the edge of the wall and would not easily pull up like the rest had. So I chiseled. And chiseled and chiseled and chiseled. (That word is kind of hard to type.) I should have had someone take a picture of me crunched down under that shelf space chiseling away. I did wear hearing protection and I did it while my kids were napping (but how did they sleep through that?) and it took forever and I was very happy when it was finished. Yay, clear nice lovely pine floor! If the kitchen floor hadn’t already been redone and I didn’t have the extra box of matching flooring, I probably would have just left it with this pine. There were gaps between the planks, but for the most part, the floor was in really good condition and looked great. But the kitchen floor had already be redone and I did have that extra box of flooring, so… vinyl plank flooring here we come! It was so very easy. The planks just snap together on the edges (one side has a tongue and one side has a groove) and they also lock together on the ends. To cut the planks to size, all you do is measure, making sure your cut end will be up against a wall (because the cut end obviously won’t have any tongue/groove on it anymore), then use a straight edge (preferably something metal… I didn’t have one at first so I tried using a piece of wood. Do not recommend!) and a utility knife to score the vinyl plank. After it’s scored (sometimes it took two or three passes because my arms are a little wimpy) you just bend it and it breaks neatly at the score. 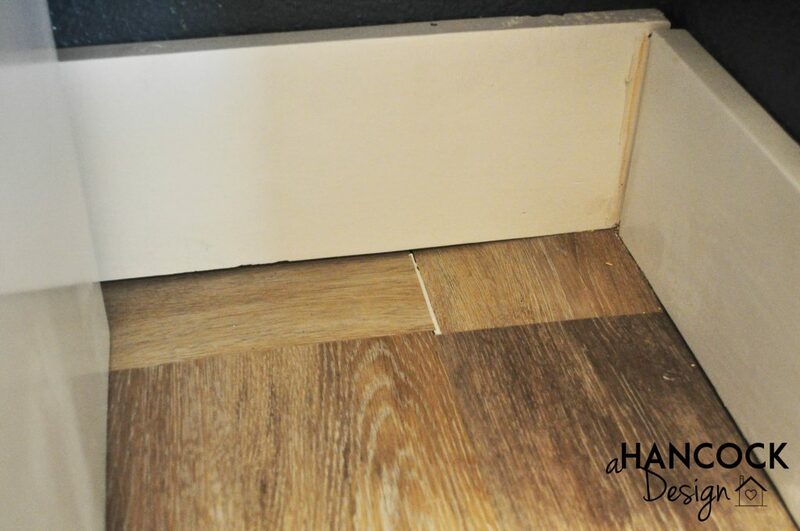 The last piece can be a little tricky to get locked in the tongue/groove and still set down on the floor, but there will be baseboard covering it so it doesn’t have to be exactly at the edge. Immediately after I cut my first plank, I saw a big problem I was about to run into. The pantry was about three inches wider than the planks, so I would have to use two planks to span the width for each row of flooring. That would mean that 1.) I would have a weird pattern across the floor where the seams were (even if I staggered the seams, I think it would still look weird in such a small space) and 2.) after a quick calculation, I realized I didn’t have enough pieces of plank to do that. So we improvised. Since the right side of the floor and the back were both under shelves and would likely be covered by stuff and not really seen, we decided to run the full-length planks one after the other from the front of the pantry to the back, butted up against the right side. That left about three inches on the right side that wasn’t covered. We had one leftover plank, so to make the best use of the square footage (square inchage?) we turned that piece of plank perpendicular to the other pieces and just kind of made it work. At the back, I had to cut a few inches off the last plank in order to get it to fit. 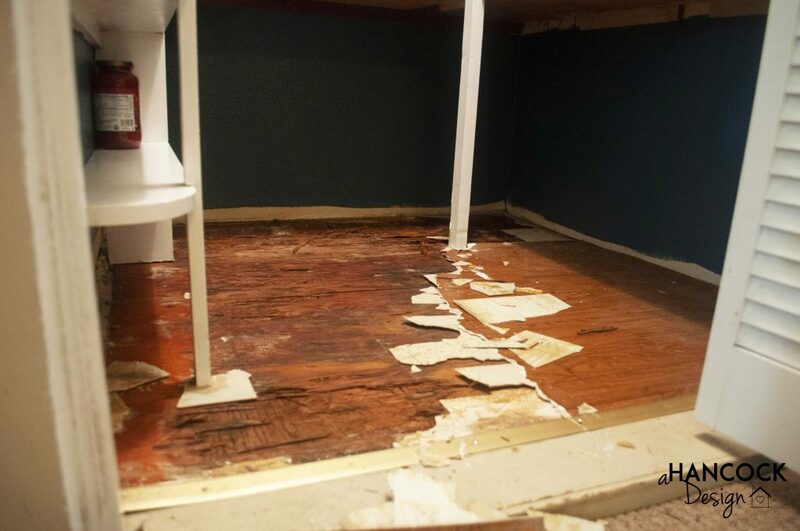 I wouldn’t recommend this if installing the vinyl planks in a more visible place (in that case, I would definitely recommend not being a cheapskate and just buying another box of flooring!) but it worked for us in this specific situation. We just used a brad nailer and shot a few nails in strategic places along that last plank, to keep it in and to keep the whole floor from sliding around. 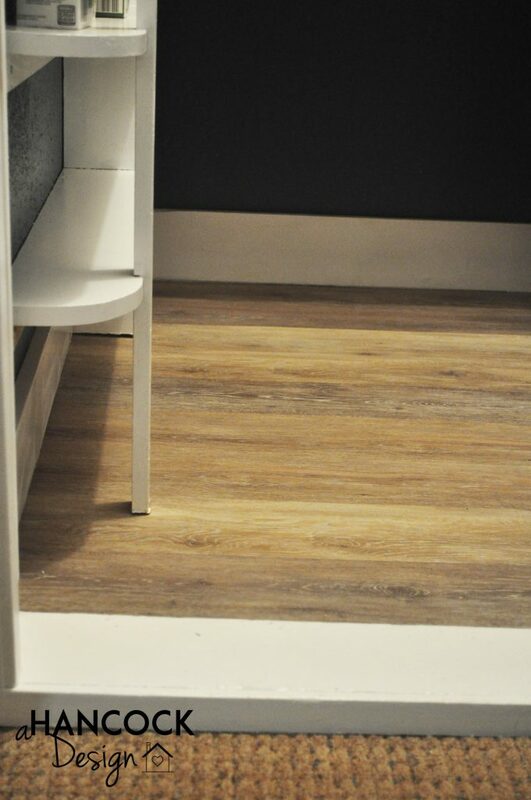 The vinyl plank flooring is “floating” meaning that it’s not glued down or really attached in any way, other than butting up against the walls. 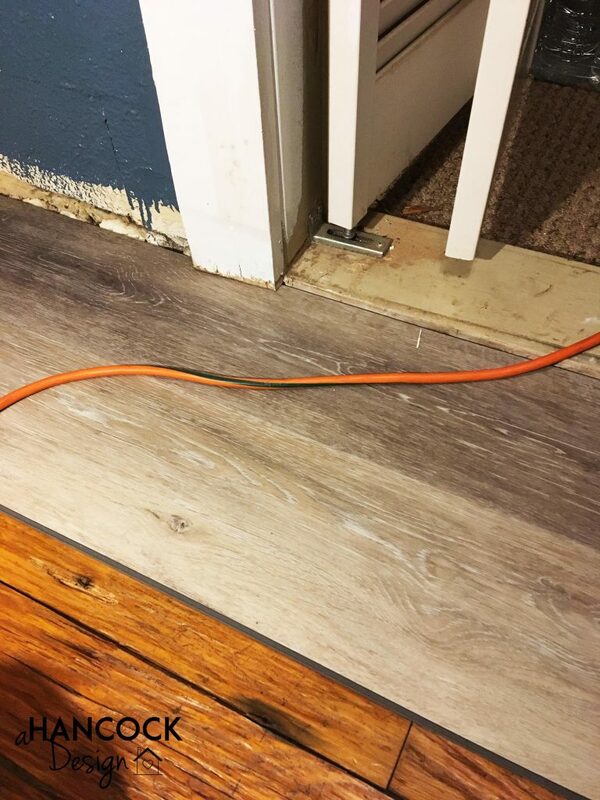 This would ordinarily be fine and the baseboard would cover the edges, but because we didn’t want to buy another box of flooring for just a couple of inches of floor, we just went with what we had and made it work. I had already cut that one end before I realized we wouldn’t have enough flooring, so I put it in parallel but then put the rest of that strip in perpendicular to the rest of the flooring. I caulked the seams so that dirt and/or water wouldn’t get underneath. I had plans to go back and paint the caulk a more tan/grey color to blend in with the floor, or I could have used colored caulk if I had it, but you would have to get on your hands and knees to see this part of the floor so I figured I could just live with it and nobody would ever know. We installed the baseboard and I caulked around the bottom edges and in the corners. All-in-all, I really liked the Stainmaster luxury vinyl plank flooring. It looks great, there is good color/pattern variation from plank to plank so it doesn’t look fake, it was super easy to install, and it feels really nice to walk on. It’s hard to describe but it’s kind of… soft? under your feet. Not squishy but really smooth and it just feels good. And that’s it! Stay tuned for the full pantry reveal cto see how the whole thing turned out! 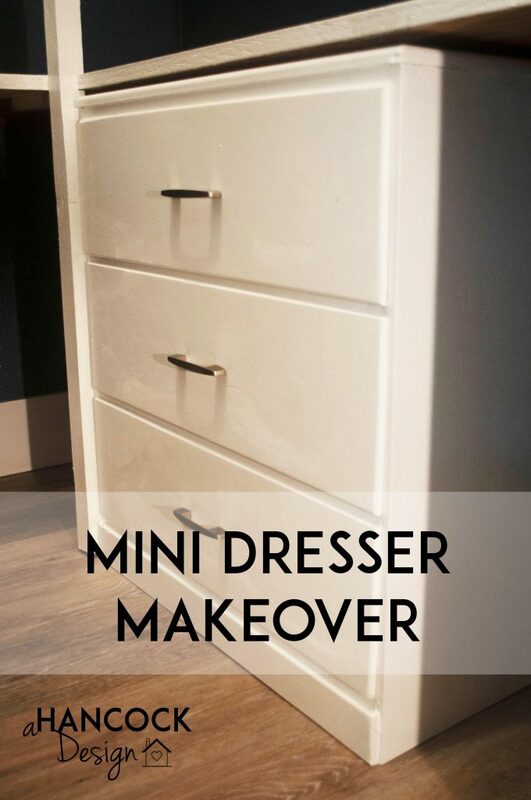 This ended up being my first blog post because it was a short project that I finished quickly, but it really is part of my bigger project of a full pantry makeover. While I was in the middle of the pantry remodel, my sister returned this little dresser to me that she had been borrowing. They were packing up their house to move to Alaska and didn’t want to take the dresser. As it sat in my entryway for several days and I kept walking around it while I was working on painting the pantry. I had the idea that the dresser would fit perfectly underneath the bottom shelf of the pantry and give me some closed storage space for things I didn’t want to look at all the time. So I decided to give the dresser a quick update before I put it in its new home. Sorry for the bad quality phone picture! Since I was already painting the pantry shelves and the door trim, I went ahead and put a few coats on the dresser as well. 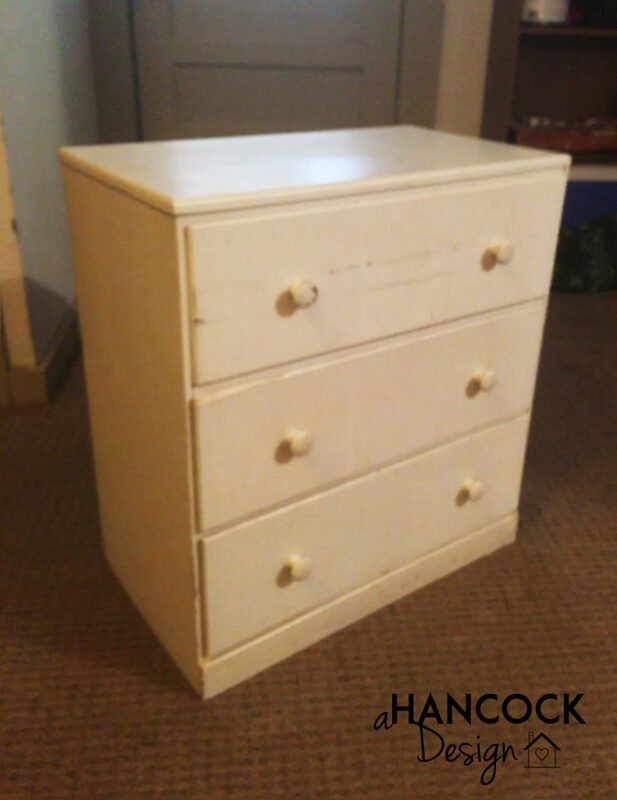 I removed the old drawer pulls (which were old fashioned, chipped wooden ones) and painted the faces of the drawers also. I painted it with my favorite white trim paint, Behr Ultra Pure White Semi-Gloss Enamel (No. 3050). It took two or three coats to cover the stains and scratches. After the first coat, I used some wood filler to cover up some blemishes in the front of the dresser and also the holes from the drawer pulls, because the new ones I had gotten were center pull instead of the two knobs on each drawer. I got the new pulls from the local Habitat ReStore (actually renamed but that’s what it used to be) and paid $2.18 for three matching drawer pulls and a random bonus one. Not bad! After the paint dried and I was satisfied with the finish, I got the drill and a tape measure and carefully measured, drilled new holes, and installed the new pulls. It was a little tricky because I’ve never installed drawer pulls before and each pull had two holes that then needed to be lined up horizontally with each other and centered. I finally figured it out and did drawers #2 and 3 in about half the time it took me to do drawer #1. The dresser was very slightly too tall* to fit under the bottom shelf in the pantry, so I drew a line and cut a half inch or so off the bottom with a circular saw. It looks great and I’m really happy with how it turned out! The new drawer hardware and fresh coat of paint made a huge difference. All told, the time spent working on the dresser was probably only about two hours. Because I already had the paint and wood filler, the total cost was $2.18 for the drawer pulls. Stay tuned for the full pantry reveal! 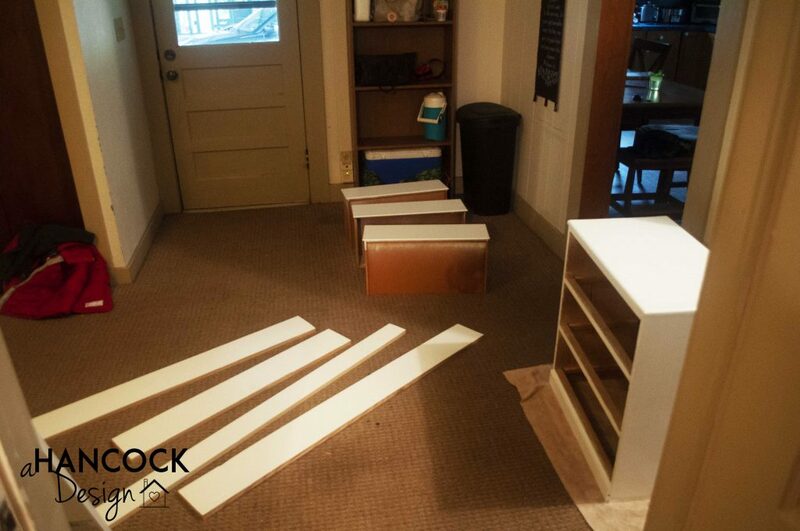 *Unfortunately I measured and cut the dresser before I installed the new floor, and when I installed the new floor it ended up being lower than the original floor, so… there’s a gap between the dresser and the shelf above it. Oh well. Welcome to WordPress. This is my first post. Edit or delete it, then start writing! Edit it I shall. I figure this is as good an introduction as any. Hi! I’m Aimee. I like to write and I like to design/build/recreate and so I decided to design and then write about it. 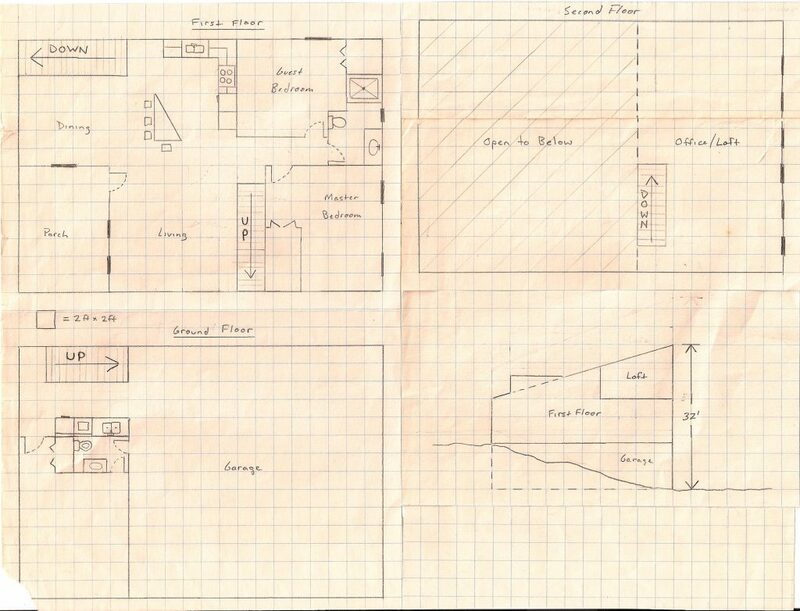 I’ve always been fascinated with designing homes and drawing floor plans. 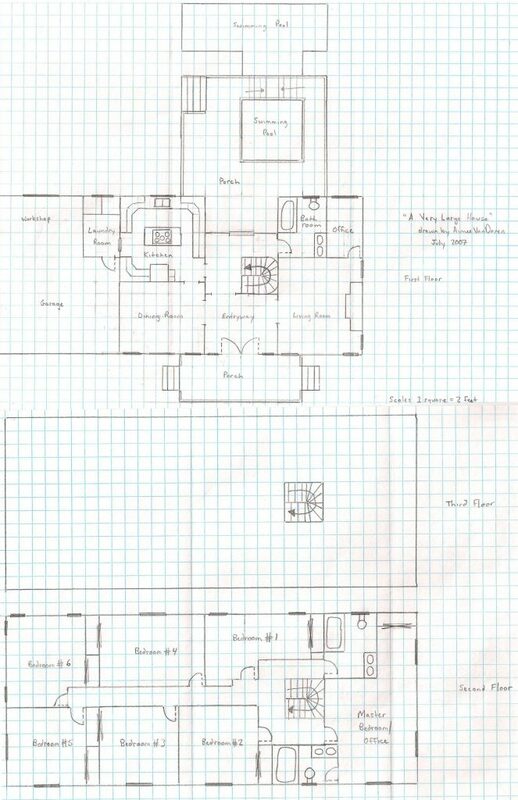 I drew dozens, if not hundreds, of house plans on graph paper as a kid, ranging from tiny houses to massive mansions. I also have a longtime fascination with tiny homes and small things in general. There are lots of interesting facts about me which perhaps I will disclose at a later time. For now, let’s start with the very basic basics. There are two more new babies missing from this photo! 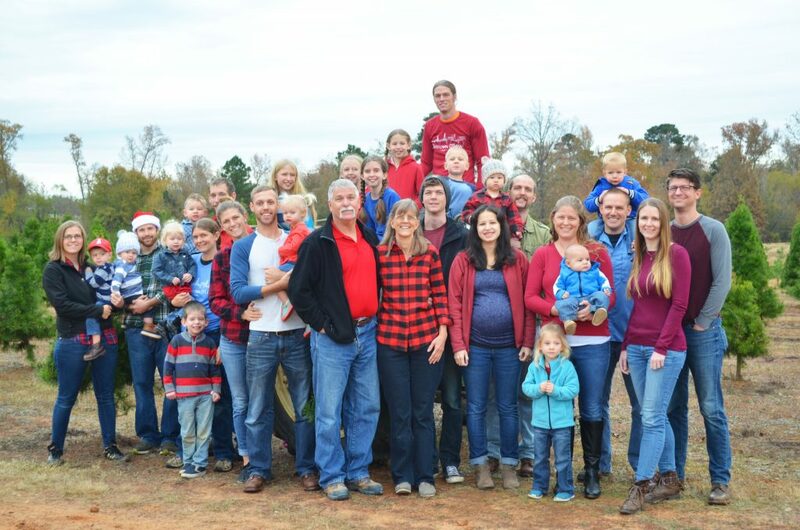 I have 7 siblings and my kids have 15 cousins on my side. I grew up in three different countries and I had moved 21 times before my 21st birthday. I’m bilingual but finding people who speak my second language is a bit of a challenge. 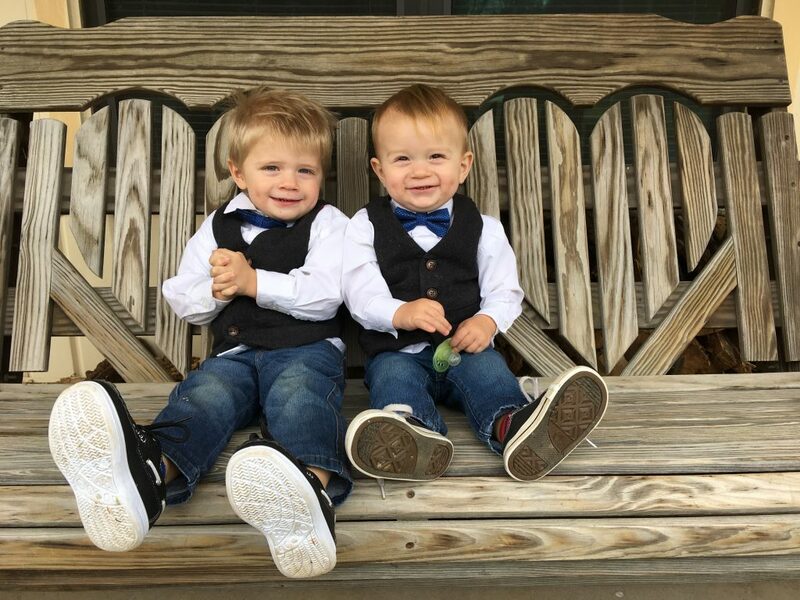 I’ve been married for six years and have two little boys who are 16 months apart and super cute! You might have thought I was just biased about them being cute, but look at them! Check back every week or so for more content! I have a lot of great project ideas in my head so hopefully I’ll have the time to bring them to fruition and photograph and blog about them too! Thanks for stopping by! Feel free to introduce yourself in the comments below; I’d love to get to know you. I like to write and I like to do projects. Sign up for a free (to be determined) and to stay updated and see what projects I'm working on!